Accurate Data & Reports to Transform your Company Culture. Learn how to Optimize your Team's Performance. Receive an overview on the health of your business. Improve the Financial Viability of the organization through Improved Quality, Performance & Innovation. Inspire & Motivate your team to Improve the Flow of Work, Communication, Ideas & Energy. Build a Strong High-Performance Team & Improve External Stakeholder Relationships. 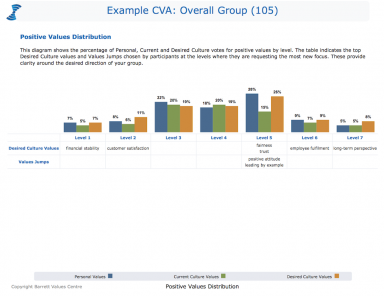 The CVA creates reports & diagrams to give you incredible insight on all levels of your business and employee performance. What You Can Measure, You Can Innovate. Your team will show you where you can improve in the business. The CVA will provide you with the required workshops & strategies based on the results to improve the profitability, performance, sustainability & longevity of your business. 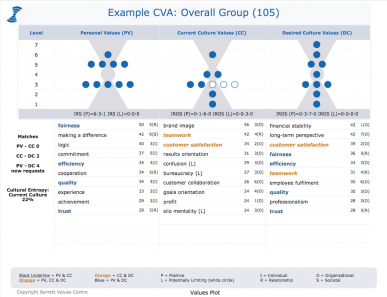 BVC provide their consultants with a variety of CTT tools used to accurately measure the health of organizations through values & other assessments. Download our SmartCulture Brochure to explore an in-depth Next Generation Business Culture program for your organization. Order & Receive CVA link to send to all individuals in your organization. Fill out 15 minute survey & allow time for your team to do the same. Receive a session with the Leadership team on your CVA results. 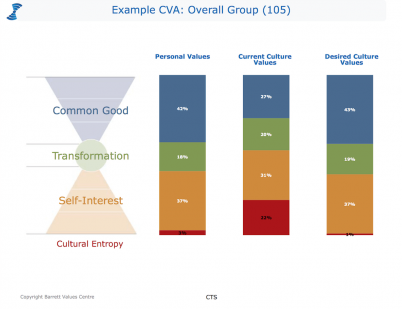 "The good companies are looking for people who understand; who they are, how they tick and what they value."